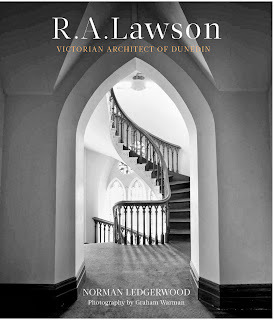 R. A .Lawson: Victorian Architect of Dunedin was launched last Wednesday by Dunedin’s Mayor, Dave Cull. Fittingly the launch was held in the Municipal Chambers in the Octagon, a grand old building designed by Lawson. The book is written by Norman Ledgerwood with contemporary photographs by Graham Warman, and documents and celebrates the work of R A Lawson who designed many of Dunedin’s most important buildings. In his 28 years working in Dunedin from 1862 onwards Lawson designed over 250 buildings in Otago, South Canterbury and Southland, including 45 churches large and small; commercial, residential, educational, civic and institutional architecture. The author, Norman Ledgerwood is a retired architect who spent most of his working life in Dunedin and Hong Kong. His interest in R A Lawson was triggered by his accidental discovery in 1954 of a collection of 82 architectural drawings and sketches by Lawson. These were covered in dust and rolled up in an attic in the offices of Arthur Louis Salmond the architectural firm where Norman was working as a junior draughtsman. Lawson had worked briefly in the firm of his former pupil, James Salmond, after his return from Melbourne in 1900. Lawson’s most significant works — First Presbyterian Church of Otago, Knox Presbyterian Church, Larnach Castle, Otago Boys’ High School, Dunedin Municipal Building — take their place amongst the country’s most important historical buildings and grace Dunedin to this day, giving the city its distinctive character, unique among New Zealand’s towns and cities. The book provides a well-researched historical record of the life of R. A. Lawson and his life and achievements. The book is stunning, and between them, designer Richard Stedman and photographer Graham Warman have achieved an elegant, contemporary feel to an historical subject. Available from UBS Otago Ltd, Email ubs@unibooks.co.nz,. Or at your bookseller.